I recently had the pleasure of spending an afternoon with a group of 1st, 2nd, and 3rd graders at a local school. We started out our discussion by talking about differences; each student identified 1 thing that was different about them. We spent a lot of time examining these differences before they concluded no difference was better or worse; they were just different. Each child also identified one thing that they were afraid of; again our focus was not on little or big fears but the fact we all had different ones. We then spent some time discussing autism, bullying, and did some great sensory activities to help us understand a bit of what it must like to have autism. We concluded our time together by going around the circle with each person complimenting the person next to them and talking about how good it felt to be accepted and to have friends. Afterwards the children painted pictures and wrote either something they had learned about autism or something that they thought about Caden. Honestly the insight and compassion these children demonstrated gives me a great deal of hope for our future! The kids were fascinated by my blog statistics, particularly all of the countries represented. They are looking forward to being world famous artists after this blog posts. They can’t wait to share this link with friends and family and I know that they would love to hear some comments from you! According to Anna, "Caden is a nice boy. Caden is a nice friend. Caden is like others!" According to 1st grader Jac, "Autism is not horrible. People with autism might act differently. They have a brain like us." According to 3rd grader Alyss,a "Caden is very special. He is also very different from other, and I think he is very cute!" According to 1st grader Maia,"Caden is nice. Caden is different. I am different." According to 3rd grader Meli, "Some people with autism don't have friends, but you don't have to treat them that way. Because everybody's different. They're just like you. People with autism are good at hearing, tasting, speaking, seeing, or feeling. Sometimes they do things that people wouldn't do to calm them down. It might look weird but that's what they do." According to 1st grader Izaak, "Autism is not bad. We are all different and that's okay." According to 3rd grader Makayla, "Autism is something they feel, taste, see, and hear things. Caden has autism too. Caden has a brain that is a big brain just like the rest of us." According to 3rd grader Dylan, "Autism isn't bad. Caden can finish a puzzle really fast. People with autism are different just like everybody else is different." 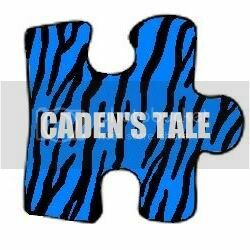 "Caden is very special and is different. It doesn't matter because we are all different." According to 3rd grader Lily, "I learned that one out of three people with autism get bullied. I also learned that people with autism feel, hear, see, smell, and taste different. I also learned that people with autism can grow up to do anything." According to 3rd grader Journie, "Autism is when your brain is wired differently. Caden has autism. I help Caden with his spelling." According to Bella, "When Caden sees a bright light he gets kind of scared. When eats a banana, he thinks that it is slimy." "Autism is a disorder. Autism is when wires cross in your brain. When I was little they thought I had autism." According to 3rd grader Jarrell, "When Caden sees a bright light he gets nervous and scared. Caden has lots of friends." Ryley do you know Lady Gaga? Yea Caden I know Lady Gaga? And so the conversation went until Caden was thoroughly upset because Ryley didn’t really know Lady Gaga but instead knew of her and her songs; Ryley was upset because she once again had no idea what she said that upset her brother so badly. Side note: Caden saying Lady Gaga was just too cute for words! I’ve said before that Caden’s flavor of autism is particularly literal. This doesn’t sound like a big deal but it is a constant source of frustration and meltdowns in our household—and honestly we all fall victim to the literal-figurative trap on a regular basis. We all stumble though in different ways. Ryley is just at that age where slang and slightly-too-moderately obnoxious back talk seems to be the norm. Neither make sense in Caden’s world. For example in Caden’s world “that’s cool” means that something is of an acceptable temperature to eat, drink, or bathe in. Obviously Ryley’s meaning is very different when she is describing a day’s event. “Whatever” is a particularly confounding word to Caden because it doesn’t fall anyplace on his either or continuum. To be fair, whatever isn’t a particular favorite of Caden’s daddy either and it appears that mommy has a bad habit of using this one a lot too! A number of incidents occur in the car on the way home from school because Ryley wants to tell us a story while Caden is baffled over what the story means. She gets upset because he is interrupting, he gets confused over what everyone is talking about, and we get upset because they are arguing. In a perfectly logical the kids have gone to bed kind of way, this whole thing can be avoided with careful word choices but how do you tell a 6th grader to expand her vocabulary to meet the increasing demands of achievement testing while telling her to keep things simple for her brother. Can you ban slang simply because her brother doesn’t understand it? Simply put—there isn’t a solution that works and is fair to both of them. Of course metaphorical phrases like it is raining cats and dogs are red flag triggers and with a little mental energy can fairly easily be avoided. But what happens when you try to get Caden involved with a sport to encourage social interactions only to have a child or another parent enthusiastically cheer “go Caden?” What happens is that Caden thinks you literally want him to go, he doesn’t understand what he has done wrong, and he ends up on the ground in a fetal position rocking back and forth. Starting to see the challenges yet? Now consider that language implies an either or situation for Caden. Everything is black or white, one thing or another. There isn’t a place in Caden’s world for shades of gray or subtle nuances. Caden knows that 1 minute literally means 60 seconds so telling him in a minute better mean that you are going to follow through in 60 seconds or we are going from a 0-60 meltdown in lightning speed. Same thing applies if you give him 10 more minutes to play; he can’t handle more or less time than that. Honestly Caden learning to tell time has not overly helped us with the literal language situation although I’m super proud that he loves numbers so much! This is just one example but consider a situation that recently occurred in our household compliments of mommy. I asked the kids if they wanted me to make eggs for lunch. They both said yes but when I got to the kitchen I realized we had hard boiled the last dozen to color for Easter. Changing lunch plans for Ryley wasn’t a big deal but for Caden I had, in his world, broken my word. In his words, I lied to him. Most of us can understand that I had no intention of deceiving him but his world doesn’t allow those subtle lines to be drawn. I had in essence made a promise that I could not or would not follow through on. Of course he had something else to eat for lunch eventually but he still references my lie. Something that has stood out to me since my first graduate communication course years ago was the following question and answer. What’s in word? Everything. In our household that couldn’t hold more truth. Just like my blog, some days the examples are adorable and some days they are horrific but they are all just a part of Caden’s tale.